Dear readers, when I was in New York I spent so much time walking and looking at the buildings, monuments, museums...I saved one of the last days of the holiday to go out for heavy shopping. Of course, one of the places I had to go to was the Tiffany flagship store, on the 5th Avenue ! The place is amazing, there are 6 floors (well, the 6th is for customer service). I visited them all and the more I looked at those wonderful objects, the more I would have liked to have them ALL !. The third floor was for the sterling silver series and we stopped there, lol. 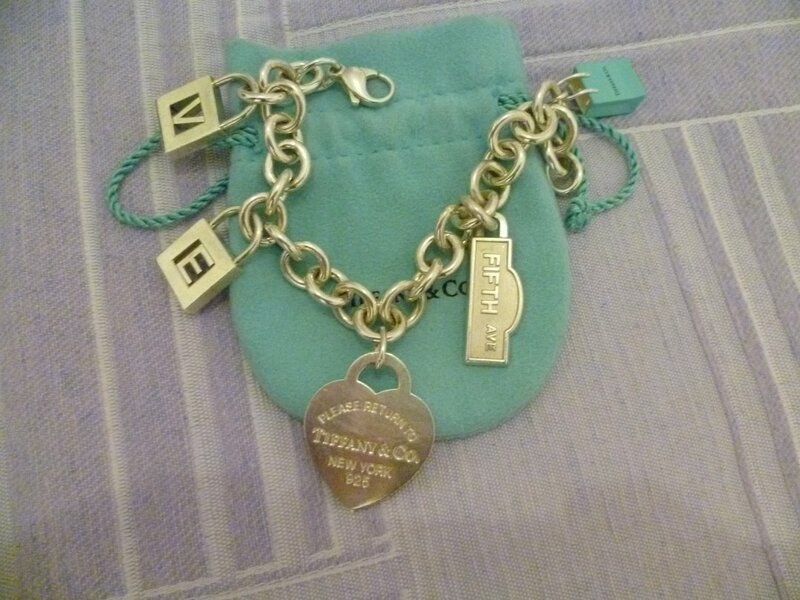 I chose a wonderful bracelet, I wanted a few charms to remind me of this wonderful honeymoon so I decided I'd attach to it two locks with our initials, a bigger heart, the "5th avenue" tag and also the tiny Tiffany bag. The result was so cute !. I had to wait until the afternoon to have my bracelet back cause they had to put the charms in a permanent way, to my request. I also got myself another key, a smaller one with the blue heart and the extra big "Return to Tiffany" tag with a very long chain. When I went out from it I wasn't satisfied yet so I heaeded to Henri Bendel, a very luxury shop you'll know about if you are a Gossip Girl viewer ;)...that place really has everything...luxury make up, bags, scarves, clothing, hair accessories...I bought something for my hair and also a scarf for me and also something to bring home for my mum and for my best friend. When I got out of it I went into Bergorf and Goodman and then to Saks, and I saw my hubby's face, he was feeling destroyed whilst I kept trying make up from Mac, Laura Mercier and Nars ! LOL ! Then we went back to the Hotel, where we took a few pics that you can see on the bottom of this post. I wish I could spend days like that one more often, hehehe ;-). Cari lettori, quando ero a New York ho trascorso giorni interi girando per la città, guardando gli edifici, visitando musei, lasciando per uno degli ultimi giorni di vacanza lo shopping sfrenato. Ovviamente, uno dei posti che mi ero prefissa di visitare è il maxi store-quartier generale di Tiffany, sulla 5a Strada ! Il posto è meraviglioso, sei piani (beh, il sesto è per il servizio clienti). Li ho visitati tutti e più guardavo quei gioelli meravigliosi, più cresceva in me il desiderio di averli tutti, hihihi !. Il terzo piano era per i gioielli in argento 925, ed è il posto dove ho potuto fare degli acquisti, lol. Ho scelto un braccialetto meraviglioso, volevo che gli fossero attaccati (in modo permanente) dei ciondoli che mi ricordassero questa stupenda luna di miele e così ho scelto due lucchetti con le iniziali mie e del mio amore, un cuore classico ma più grande dell'usuale, la targhetta "5th Avenue" e una busta di Tiffany smaltata nel classico colore turchese. Il risultato per me è super carino ! Ho dovuto attendere fino al pomeriggio affinché il braccialetto venisse realizzato apponendo i charms in modo permanente. Ho acquistato anche un'altra chiave, più piccolina, col cuoricino turchese e poi il cuore extralarge della serie "Return to Tiffany" con maxi collana. Quando sono uscita da Tiffany non ero ancora completamente appagata e mi è bastato attraversare per entrare da Henri Bendel, un tempio del lusso conosciuto anche alle spettatrici di Gossip Girl...c'è di tutto in quel posto...make up di lusso, borse, gioielli, abiti, sciarpe, accessori per capelli...ho scelto degli accessori per capelli e anche un bel foulard per me e dei foulard per mia madre e per la mia migliore amica. Quando sono uscita sono andata da Bergdorf and Goodman e poi da Saks e ho visto il viso del mio maritino con un'espressione distrutta mentre io continuavo imperterrita a provare make up di Mac, Laura Mercier e Nars ! LOL ! Poi siamo tornati in hotel, dove sono ambientate alcune delle foto che trovate sotto. Vorrei trascorrere più spesso giornate di questo tipo, ahahah ! :-). Click on the pics to enlarge ! Cliccate su ogni foto per allargarla ! This is the bracelet :) how do you like it ? Questo è il braccialetto :), che ne pensate ? Ma sei super bellissima! Sembri la protagonista di un telefilm americano :) Stupendo il braccialetto e immagino che anche gli altri acquisti siano altrettanto belli! Ooh I love your hat. I hope you had a great time shopping. Love, love, love the bracelet!! And very cute hat! You look incredible!!!!!!!!! 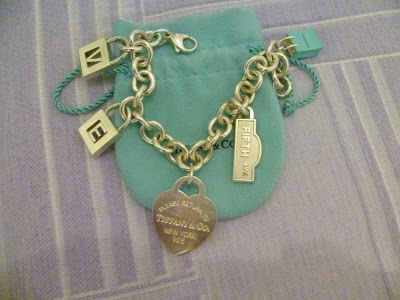 I heart Tiffany's! You look so high class chic. I love that store too. My husband proposed with a tiffany ring but it was too big and I found out they always send it to NYC store to get it sized. So, I took it myself when I was on a business trip. It was quite an experience. The bracelet is so cute! It will totally remind you of this time in NY! Looks like an amazing shoppin day! Enter my giveaway to win a ZARA leather bag! You look so beautiful in this picture, I adore your little black dress and I love the hat, it goes so well with your dress. I’m the same way when I go on my trips, I want to see everything, visit everything and end up walking for hours but it’s the best feeling ever to be able to see amazing places. I'm a new follower! Hope you'll like my blog and follow back! classy and elegant outfit! love the bracelet! You look so chic and gorgeous... you represent Italy beautifully!!!!! I love your unique way of creating all the posts and your special writing! Not to mention the name of the blog! I was wonderring if you would have time to check mine, possibly follow each other? Hope we keep in touch! TIFFANY di solito non mi piace piu di tanto! ma questo bracciale è davvero molto bello! lo adoro!!! ho visto tutti i post *_* la vista dalla camera è stupenda!! e l'outfit col blazer fragola mi piace da impazzire!!! awesome! so classy and feminine, dear! love-love the dress-hat combo! the bag is amazing so as your shoes!total perfection. Tiffany is perfection as well. We're from Brazil and we are inviting you to visit our blog tomaraquecaiaagora.blogspot.com. If you like, you can follow us on twitter @blogTQCA ok? Se ti va di dare un'occhiata al mio piccolo mondo,sei la benvenuta!Lo troviqui! Grazie mille per il tuo commento sul mio blog! Passa quando vuoi! Penso che tra stasera e domani metterò dei nuovi scatti fatti oggi! First of all your bag is amazing! Second, the necklace is fabulous! Looking very chic :) Nice bracelet! Che bello il braccialetto e anche tu stai benissimo! Si vede che il matrimonio ti fa bene!!! Come già detto,semplicemente bellissima! l'abito del matrimonio era straordinario,faceva molto da principessa! Ti aspetto da me! Ho appena messo delle nuove foto! 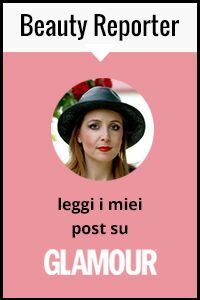 grazie mille per il tuo commento sul mio blog! se vuoi possiamo seguirci a vicenda! ti auguro uno splendido week end! Hi there!!! You are SO chic and pretty!!!! I think I will follow you from now on!!! have a GREAT Honey moon!!!!!!! And shop till you drop!!!!!! Love the bracelet! And the name of your blog:-) Thank you for stopping by dear.. Following you.. Follow me? i miss new york, im glad you had a wonderful time there. the bracelet is stunning. what a better way to remember it all. I love that store. It is a must if you come to NY. Thanks You, You are beautiful pics too (: .! I love your Clothes ! ho scoperto per caso il tuo blog e mi piace molto! Your outfit is absolutely gorgeous!! I have created a bloglovin, so now you can follow me, follow you now! che meraviglia il braccialetto che hai comprato! dev'essere stata una giornata meravigliosa!! :) un bacio! You are very beautiful. Great photos. You look great! Thanks for your comment on my blog, sorry for my late reply. Grazie di essere passate e anche io ti seguo volentieri! Thank for your comment ! Your blog as well ! I'm a member ! = ) ! Beautifuls pictures and looks ! Ma che bello il tuo blog :) Belle foto grazie per la visita! Ti va di seguirci? What an amazing trip! love the bracelet!! Oh yeah, i don't have google friend conect but i have BlogLovin: http://www.bloglovin.com/en/blog/2773430/tomara-que-caia-agora actually, i follow you in there and i have twitter too @blogTQCA! wow! these pics are sure making me jealous!! I very much like your big floppy hat in these pictures. Super cute! that's a beautiful bracelet! You look chic too, nice hat! Thanks for the sweet note on my blog! HAve a good week! Perefect outfit for the perfect trip! Love the bracelet. It's funny, I also watched Breakfast at Tiffany's on Sunday! Che carina!! !Stai benissimo e le foto a NYC sono stupende! Hope you didn't have only $10 to buy something (thinking of the scene from Breakfast at Tiffanys :)). Love the bracelet. You look great! I love your dress!!!! 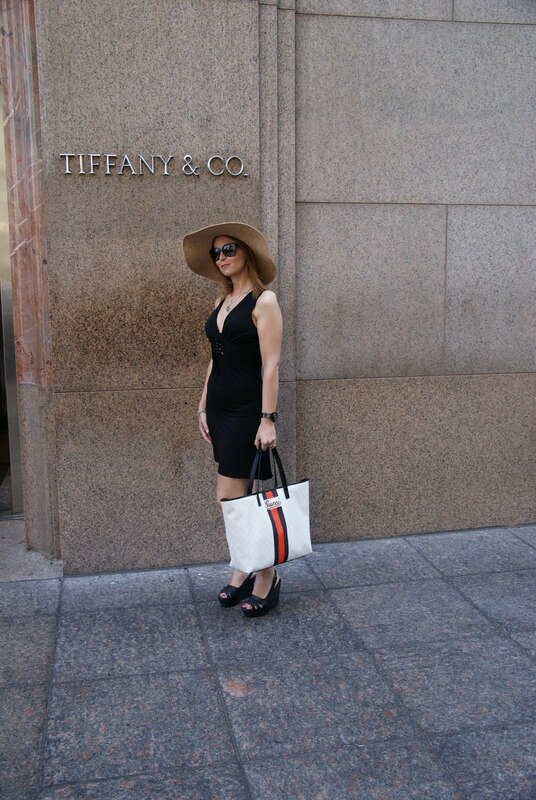 So much fun to be shopping at Tiffany's! Ohhhh ke meraviglia!!!! non vedo l'ora di poter fare tutto questo anche io!!!! il tuo bracciale mi piace moltissimo!!! in particolare la medaglietta con "fifth ave" mi hai dato un bello spunto su cosa acquistare ;)! Totally Diva! I just love the purse and the bracelet!! you are incredibly beautiful and elegant.. I love New York !